You’ve Googled, Bing’d, and even asked Jeeves, but still haven’t found the right template for your project. It’s not like there aren’t enough options. If only this game weren’t a western theme. This one might work if the menu were on the left. I like this one but the colors aren’t in season. Pfft, this one is too outdated for my learners. And who creates pirate training? We hear this all the time and it’s totally valid. I mean, it’s not like you open a template and press the Convert Template to Match My Course Design button and voilà, your template is ready to go. Basic customizations like changing the template’s colors and swapping placeholder graphics are easy. For most course designers, the real challenge is seeing the template for more than its intended purpose. 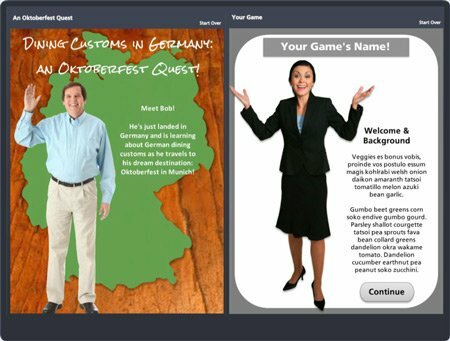 A few weeks ago, community member Jackie Van Nice shared a really fun game template for Storyline. The template was based on a custom project Jackie created for an earlier e-learning challenge. You can read all about both projects on Jackie’s blog. She even recorded some video tutorials to help you get started with the template. Seeing both the template and custom versions reminded me of the importance of leveraging existing course assets for one's own e-learning projects. And that's what this week's challenge is all about! You can totally participate! In fact, not having the same software is exactly the type of constraint this challenge is all about. The objective here is to leverage the essence of the template into something for your own needs. Update: Jackie shared a PowerPoint version of her template in a recent discussion. 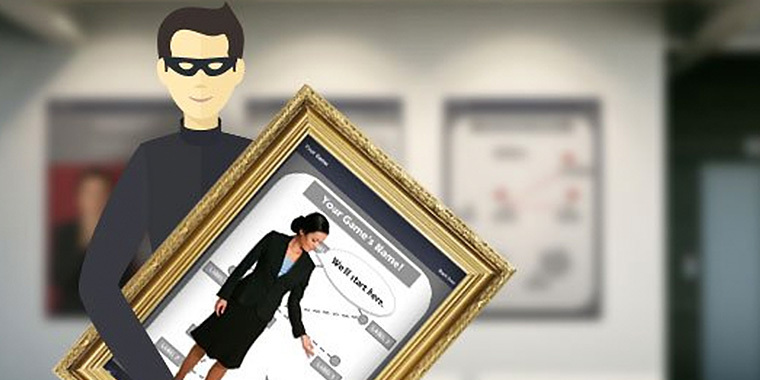 You can use Articulate Storyline, Articulate Studio, or PowerPoint to create your template makeover. Wishing you a customized week, E-Learning Heroes! You outdid yourself on the graphic, David! The background art is such a great detail. I'm working on the challenge too, and trying very hard not to include beer or trains or Germany or beer. (Or beer.) It's hard. Thx, Jackie! My working title used "customize" but the design mapping wasn't giving me much to work with... Nothing beyond elearning elves hammering away on template revisions at the North Pole. Too early (and warm) for elves. I'm making time this weekend to jump into this challenge. I haven't ruled out beer, Germany, or beer themes. Right now, everything's on the table. That's the spirit! (So to speak.) I'm only ruling out beer to avoid repeating myself. I'm very happy to hear beer is still on your design table. I'd love to see anyone else use it, too! Glad to hear you're playing along! Great challenge David. I just got some ideas for this one! Hi Jackie, Thanks! I did it for fun. I don't create a lot of eLearning typically, as I wear many hats for my role. I picked the theme because I was a waitress years and years ago and there was never any formal training. I also tried to use 100% of royalty free images, sound, and edited many of my images using Illustrator and Photoshop. I like your theme it is very playful! I have decided to do another one. This is just too much fun! I am hoping I can have it ready for tonight (Hint: it it going to be based off a TV show). I am off to get started! Ew. Just noticed that some of the navigation from challenge to challenge is off. Hmm...will need to fix that. but hopefully you get the gist. Hello, I was wondering if the template is available in PowerPoint? I don't have Articulate...yet, and wanted to get in on this challenge. Thanks in advance for any assistance. Melissa, those are awesome, I love the GOT one. I have also never participated in a challenge but will be posing something here real soon for this one. Thank you, Scott! I forgot to mention that mine is better viewed on a computer because it has hover triggers. Maybe I will make a more mobile friendly version. I think I should have changed the dimensions of the template too because it does not quite fit my PC. @Andrea - The template is only in Storyline but the general essence of the interaction can be achieved in PowerPoint using hyperlinks. I started mocking something up in PowerPoint for you and will post later this morning. David - If you've got a PowerPoint version started and need some help, just let me know and I can work on it. Hi Mary - Such a unique idea! The first time through I had to make Omar pretty sick just to see what would happen, but the second time through we helped a lot of people. :) How did you keep track of the score and whether or not a flag came down on the board? Did you turn each of the challenge questions into a graded quiz question, or did you add your own variables? You're more than welcome for the template! It's waaaaaaay more gratifying to see how someone like would use it rather than just leaving it to moulder away on the shelf! Thanks for posting the PowerPoint template, Jackie!